Joe-pye-weed and its three varieties in North America are tall, striking, pink-flowered perennial wetland species. Our variety, var. bruneri, is found in North America mainly west of the Mississippi, in the northern and central United States and in Canada (Ontario west to British Columbia) (USDA 2011). In British Columbia, it is reported from the lower Fraser Valley, with one station reported in the Revelstoke area. Habitat includes "wet to moist swamp or pond margins and forest openings in the lowland zone" (Douglas et al. 1998); it is also found along stream and canal banks, in wet meadows, bogs, and seeps, and on calcareous soils (Flora North America 2011). In the Revelstoke area, it is found in a calcareous fen. This is a summer to fall flowering plant. 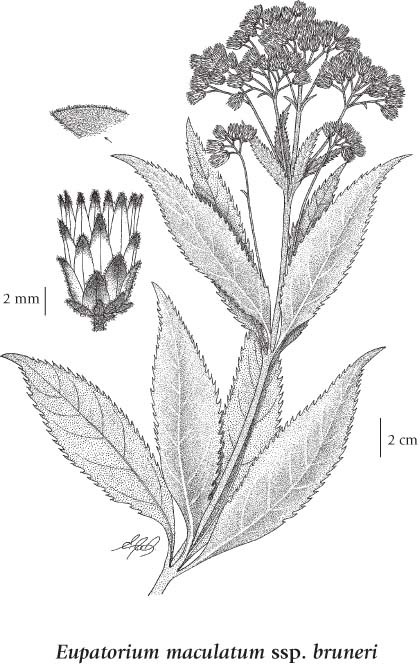 A detailed description of Joe-pye-weed is provided in Flora North America. Perennial herb from a fibrous root; stems solitary, stout, branched in the inflorescence, 60-200 cm tall. Stem leaves opposite or whorled, mostly in 3's or 4's, lanceolate to lance-elliptic, narrowing abruptly to the stalk, 6-20 cm long and 2-7 cm wide, sharply saw-toothed, lower surfaces covered with spreading, curly hairs. Heads discoid, clustered in somewhat flat-topped clusters, rarely solitary; involucres 6.5-9 mm tall; involucral bracts graduated, often purplish; disk flowers purple, 9-22, tubular and perfect. Achenes 5-angled, glandular; pappus of numerous hairlike bristles. Wet to moist swamp or pond margins and forest openings in the lowland zone; rare in the lower Fraser Valley; E to NF and S to UT and NM, probably introduced. Eupatorium maculatum subsp. bruneri (A. Gray) G.W. Dougl.